Aluminium Bi-Folding Doors are one of the most popular home improvements we offer. They bring light and space into your home as well as providing a large clear opening. Our range of Aluminium Folding Doors is manufactured from dedicated profiles designed by Smart Systems, one of the UK’s leading architectural aluminium system suppliers. Smart’s Visofold series of Bi-folding Doors have been available in the UK and Europe for a number of years offering both domestic and commercial folding door applications using Visofold 1000 and Visofold 4000 respectively. 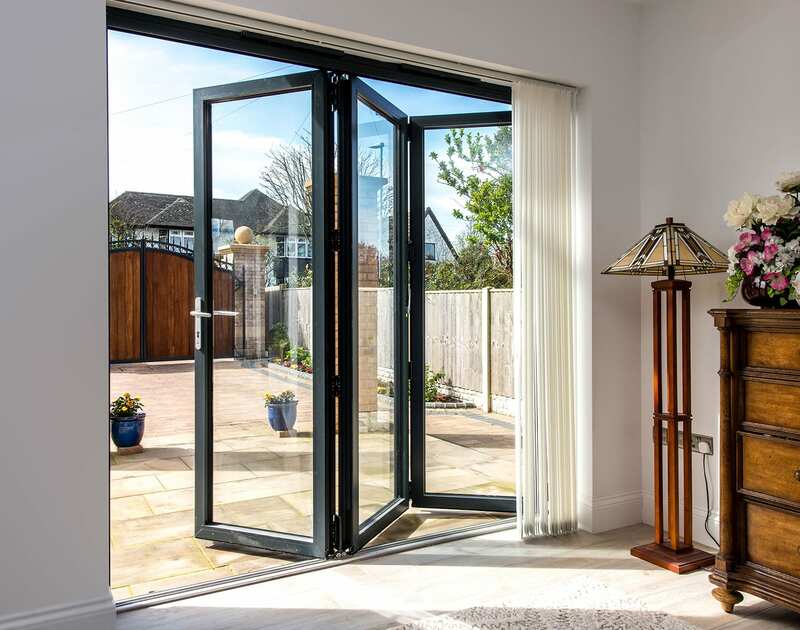 Our Aluminium Bi Fold doors are manufactured from slim 60mm thermally broken profiles to ensure maximum glass widths can be acheived using the minimum number of panels. This allows for more natural light and unobstructed views of the outside world. There are no additional mullions required between the panels that broaden the sight lines so when panels are folding and sliding in the same direction, the width of the aluminium from edge of glass to edge of glass is just 132mm.